Today, everything's an ad. Or a game. Sometimes both. 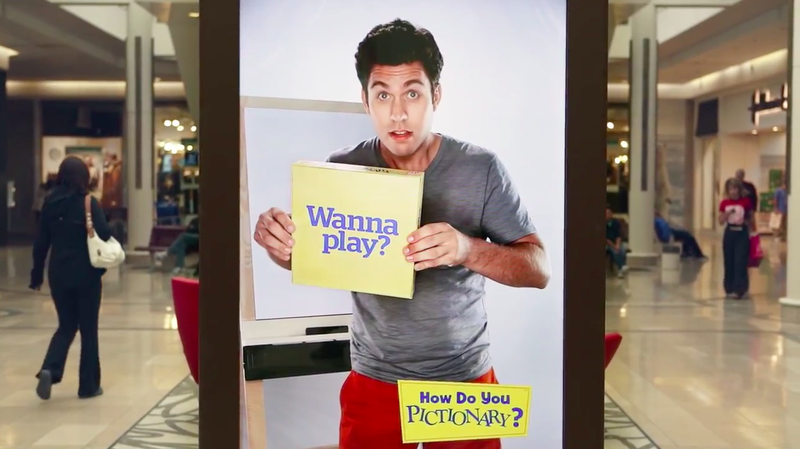 Agency TrojanOne in Toronto created this mall installation in Canada for Mattel's Pictionary. A display that initially appears to be a poster is actually a video screen. It springs to life with an interactive Pictionary challenge illustrating the tagline, "See what happens when you take the time to play." It's a fun variation on an ambient theme that's been executed in different ways elsewhere for various products, services and causes. Some of these campaigns have been out of this world, others can seem sinister or invasive, while one heartfelt effort is blowing folks away. Here, a bright, inclusive mood really resonates, and it's hard not to be drawn in by the video's infectious high spirits. In a world where everything, it seems, is an ad or a game, it's comforting to know that you can win a ginormous teddy bear sometimes.